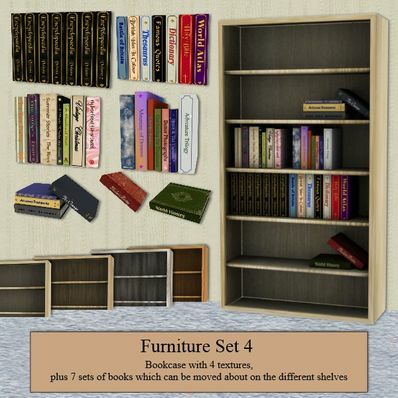 Bookcase & Books for use in Daz Studio 4. Seven sets of books plus 4 textures for the bookcase. Always need books. Thank you! Got a Study scene planned and this will flesh out the room nicely. Thanks! Ah - would've saved me a lot of work if I'd known about this first! But thank you! great add-on to any indoor scene... thanks for the share.. The bookcase at 100% is just a bit taller than Genesis and at 50% scale comes up to about Genesis's chest. The books are of course, scaled so they fit the bookcase. I don't know why your's is so big. No body else has mentioned any problems t me. Thank you, this is so helpful for making a dorm scene I'm working on. The scale seems off to me, however. Even at 50% scale, the bookshelf measures 8 feet tall. The books are the same scale as the shelves, for better and for worse. This is, mind you, a trivial issue given the incredible quality level overall and the flexibility with the books. Thank you very much. Thank you very much. I love this bookcase. This awesome bookcase It reminds me of my own bookcase. Wow! Seven sets of books with 4 textures, that is so fantastic!! Super Duper!!! TKU!! Excellent work.. Can find use for these. They are prefect. Thank you.